Planning is the backbone that holds up any project. 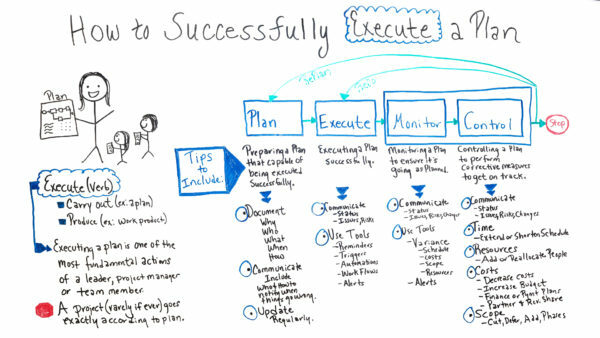 Jennifer Bridges, PMP, shows you how to take that plan and execute it right. Execute is a verb. Jennifer noted that when you execute something, it means to carry it out, such as a plan or product, as in a work product. The act of executing a plan is fundamental in any project. It’s one of the paramount actions that a leader, project manager or team leader is responsible for. That said, when executing a plan, it’s rare that everything goes according to that plan. Therefore, Jennifer wanted to provide some practical tips to help execute a project plan successfully. To begin with, there’s the plan. When preparing the plan, make sure that it’s capable of being executed successfully. This starts by thorough documentation, the why, who, what, when and how. Then there’s project communications, which includes the who and how they will be notified if and when there is an issue. And always update these steps throughout the process. Next is the execution of the plan. To do this successfully also involves clear communications. There must be status updates and a quick response to issues and risks as they arise in the project. The use of project management tools will help with this. You can set up reminders, triggers, automations, workflow, alerts and all manner of automated tools to help keep on top of the project and not lag behind, which will take you off-track. When monitoring a plan to ensure that it’s going as planned, again communications should be the foundation to build toward success. Monitoring makes sure that the project is proceeding correctly, and tools like status reports and keeping up with issues, risks and changes is how you do that. There are methods to help too. Knowing the variance on the costs, schedule, scope and resources helps to monitor. Again, having alerts set up will also make sure that nothing falls through the cracks. Finally, there’s control. When controlling a plan, you’re performing corrective measures to get back on track. As always, this starts with communications, status reporting, identifying and tracking issues, risks and changes. You can always work with the different constraints of the project to help you get back on track. For instance, you can extend or shorten the schedule to deal with a time constraint. You can also add or reallocate people, if you’re up against a resource issue. If it’s costs, then you can decrease costs. You might have to get approval to increase the budget, get more finances or partner with someone. Scope can be cut, deferred, added to, etc. Pro-Tip: When executing a plan, you want to make sure it works. But sometimes you hit a wall that cannot be climbed. If you’re stuck, you’re not finished if you have made a contingency plan. So, always have a Plan B in the drawer just in case. Today, we’re talking about how to successfully execute a plan. When we talk about executing a plan, we’re really talking about carrying out a plan or producing something like a work product. Executing a plan is one of the most fundamental actions that a leader, project manager or team member can make, and to remember when we’re talking about a project, things rarely, if ever, go according to plan. So, in today’s whiteboard session what I wanna do is offer some tips. So, when we talk about executing a plan, we’re not talking about just running out and executing a plan, we have to make sure some things are done before and during as we’re executing the plan. So let’s talk about the tips that we wanna offer for planning. We wanna be sure that we’re preparing a plan that’s capable of being executed successfully. And we also wanna talk about executing a plan successfully, what are those things we have to do. And then, when we monitor, we’re talking about monitoring the plan to ensure it’s going as planned. And then, controlling is controlling to perform corrective measures to get the plan back on track. So let’s take a look. So when we’re talking about planning, we wanna be sure that we document the plan. We wanna include why are we doing this plan? Why is it so important? Who’s going to be doing what, when and how? Then, once we document that, we wanna take it and we wanna communicate it to everyone who needs to know. The team members, the stakeholders, maybe even the executive board or even our vendor partners. We wanna include who and how to notify when things don’t go in the right way. We also wanna update that plan on a regular consistent basis to ensure that when things change it’s updated. So then, when we talk about executing the plan, we also wanna be sure that we’re constantly communicating the status, any issues that we see, any risks that we may project that we need to prepare for. We also wanna be sure to use tools because we want to set up reminders to let people know when things are coming due. We also wanna be able to set up some triggers so…that are action-based. For instance, if one action occurs then it triggers another action in a workflow. We also wanna set up automations, workflows and again, alerts. So then, when we monitor the plan, again we’re looking at to ensure that it’s going as planned. So we wanna communicate, again, the status to let everyone know that needs to know that everything’s on track or something may be projected to be late. We also wanna flag any new issues, risk, or any possible requests for changes. We also, again, wanna use tools. And when we’re monitoring, we wanna use those tools to indicate what’s the variance. What’s the variance of the schedule? Are we ahead of schedule? Are we behind schedule? We also wanna look at cost and budgets. Are we over budget? Are we under budget? We also wanna look at the scope, is that on track? Have we added scope? Do we need to take some out? And also, resources. Do we have enough? Do we need to supplement? And then also alerts. But when we talk about monitor, some people make the mistake of just monitoring. So they see these things occurring, but they’re not taking corrective action. So it’s the controlling part that is just as important, and these two really work together hand in hand. So when we talk about controlling, again, we wanna communicate the status of any issues, risk, and changes, but these are the things we wanna look at too. We want to be controlling the time. Do we need to extend the schedule? Do we need to shorten the schedule? Resources, do we need to add resources? Do we need to maybe reallocate them or do we need to let some go? And then, according to the cost, we wanna look at do we need to decrease the cost? Do we need to increase the budget? In some cases, we may need to finance new cost, we may need to set up a payment plan, or we also may consider partnering with another strategic partner and set up maybe a revenue share that can offload some of the cost, but be able to share some of the revenue. And again, looking at scope, do we cut some of the scope? Do we defer it maybe to later? Do we need to add scope or do we need to put it in phases? So as you can see there’s so much more than just executing the plan. So if you need a tool that can help you execute your plan successfully, then sign up for our software now at ProjectManager.com.